Travis Browne apparently is 6'7" Hawaiian Santa Claus. On the night before Christmas, Travis Browne, like most parents, began to think about the day that his children were about to experience. He thought about the toys and smiles and laughter. He thought of the memories that were soon to be made and the pictures soon to be taken. Yet he was not going to be there to see any of it. It was the same thing on Thanksgiving and Halloween. 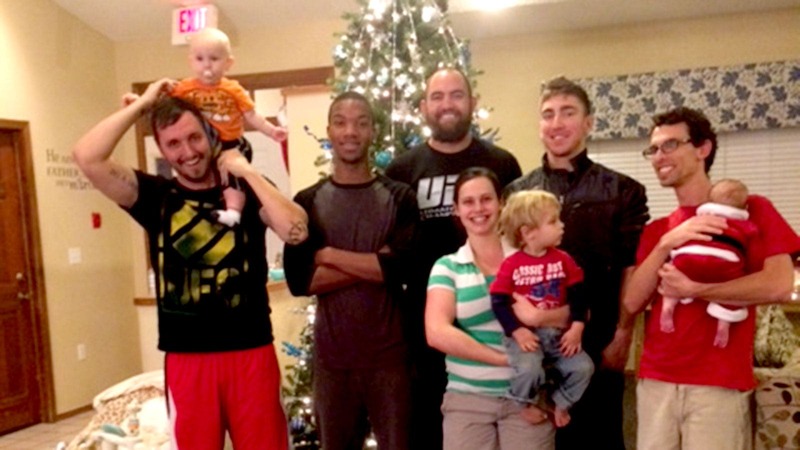 While Browne was holed up first in training camp in Albuquerque, New Mexico, and now at the UFC 168 event location in Sin City, his boys were back home in San Diego with their mom. These are the sacrifices professional fighters make. 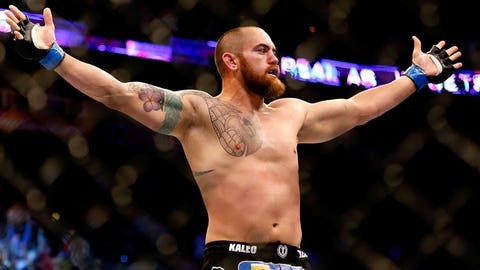 In a few days, after his fight with Josh Barnett, he could begin making it up to them, but in that moment, in the last hours before Christmas, Browne grew upset at the thought of not seeing the joy on their faces. In a moment of inspiration, he picked up his phone and called a member of the UFC’s public relations team with an idea. If he couldn’t put a smile on his own children’s faces tomorrow, what about doing it for someone who needed it more? Before long, the idea had true purpose. There was only one problem. It was nearing midnight and stores were closing for the holiday. With limited options, Browne ran down to the stores in the MGM Grand Hotel and loaded up on backpacks, sweatshirts and other things kids might want or need. And on Christmas day, he walked into the Nevada chapter of Boys Town, a child and family support group that takes in boys and girls from troubled backgrounds. Six-foot-seven UFC heavyweight Travis Browne was there to play Santa Claus. You don’t have to make a choice dictated on what others put in front of you. You can carve your own life in this world. "You can tell he’s a dad at heart," Boys Town’s Doug Spellman told FOX Sports. "He is one of the nicest, most down-to-earth fighters I’ve met, and we’ve met a few here. He was super cool. He stayed and chatted with us for a long time." Browne even sat down to dinner with them, sharing tales of his career, his life and lessons learned. That was what mattered most to Browne, not the presents he could deliver but the time he could offer, the sentiment that someone cared. After all, it’s something he might have needed once upon a time. Browne grew up with parents that he says were constantly "making mistakes," which could have put him on either of two very different paths. Over time, he learned to take the hard one, the right one. Through his own experience, he could help explain to them that anyone could succeed. Browne hoped to do all of this under the cover of darkness. In fact, when he was first approached about speaking about it, he was hesitant to do so. So was Spellman. And a UFC PR person had kept it under wraps under Browne’s orders. But a Christmas gift is worth sharing, after all, and that’s exactly what Browne gave to Boys Town. Typically, the home serves kids between the ages of 11-17, although there is a child as young as 8 in the Nevada program, which has five homes on the campus, each with a maximum of six youths. On Christmas, many of the children were able to go home and spend time with their families, but there were still a precious few with nowhere to go. Those may have been the ones who needed Browne’s visit the most. "A lot of these kids don’t have the traditional Christmas or traditional Thanksgiving," said Spellman, a family teacher who with his wife basically serves as a live-in parent to six of the children. "We make sure to do it up big. Big old Christmas ham, set the table nice. So when Travis came over, it was the icing on the cake. For him to come hang out and talk, and the thing was, he wanted to be there. He kept going and going. He played with them. He got out his phone and took his own pictures. The guys loved him." Beforehand, Spellman admitted, no one there had known much about Browne. Even though the UFC has partnered with Boys Town for some time, Browne was not a well-known name to the group. Before he arrived, they got word he was coming, and went about researching his record and history. It’s not about what I can give you out of my pockets, it’s about what I can give you from my heart. It’s safe to say that he made more than a few fans that day. Spellman said the whole group wants to watch his fight against Josh Barnett this weekend. Everyone is pulling for their UFC Santa. As for Browne, it was just as rewarding from his end. After finishing up some dessert and passing out his gifts, it was time to leave. After all, this is a business trip for him, even if the side trip might have been more meaningful than his original purpose for coming to town. "During this time of year, a lot of people look at material gifts or monetary gifts, but Christmas is about giving more of yourself than something," he said. "I can always reach in my pocket for a $100 bill, but give yourself to somebody. I never really understood that until I got older. I didn’t realize how much better that is than giving someone something. This generation and even mine is based on material things. We need to get away from that. I need to get my kids away from that. The world’s going to develop the way it’s going to develop. I’m not going to be able to stop it. But what I want is for my kids and the people closest to me to understand that it’s not about what I can give you out of my pockets, it’s about what I can give you from my heart."